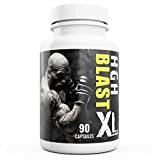 NATURAL ANSWERS HGH BLAST XL Provides Not Only Tribulus Terrestris As a Main Ingredient but Also Contains Four Essential Amino Acids: Leucine, Isoleucine, Valine And Lysine. Contains Tribulus Terrestris as a main ingredient and also contains four essential amino acids: Leucine, Isoleucine, Valine and Lysine. Super HGH XL, with its blend of Amino Acids, are particularly suitable for strength trainers. Why choose Natural Answers HGH Blast XL?